A posterior vitreous detachment, or PVD, is a common cause of a retinal tear. A PVD is normal physiologic event and eventually happens to everyone. When it occurs, there is a higher than normal chance of forming a retinal tear. A retinal tear may lead to a retinal detachment, a potentially blinding condition. When we are born, the vitreous, a watery protein-laden gel, is very homogeneous and optically transparent. It fills the inside of the eye just as air fills a balloon. With time, or aging, the proteins break down forming cavities of water. The situation is very much like Swiss cheese, except there are pockets of water instead of air. At some point the gel collapses on itself and condenses (the same way a cake falls when brought out of the oven). The posterior portion of the vitreous detaches, or separates, from the retina, yet the more anterior portions remain attached. The condensed gel no longer fills the entire eye and now has more room to move back and forth. When a PVD occurs, the symptoms of flashes and floaters are commonly noted. The flashes develop from the physical tugging of the vitreous on the retina. 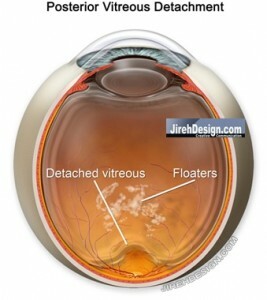 The floaters can be caused by condensed proteins, blood or cells/debris from underneath the retina. A posterior vitreous detachment can also be asymptomatic. You should tell your doctor about new flashes and/or new floaters. If caused by a PVD, a dilated eye exam must be performed looking specifically for a retinal tear or retinal detachment. Your pupils should be dilated when the symptoms first occur and then, again, six weeks after the initial symptoms.It is during the first six weeks following a posterior vitreous detachment that you are at greatest risk of forming a tear or retinal detachment. At any time, should the symptoms worsen, even in between visits, please alert your eye doctor.